The last two days have been such fun days but long, fill days for the kids. So this morning after we all woke up rather late I decided to change my plans for their learning activities for the day. I thought something a bit different and something we could do together around the kitchen table (while I baked) would be good. I was not sure at first what to do so I had a quick look at the latest Activity Village newsletter and started going through the new content on the website when I remembered the Weather Myths. We have been looking at some weather lately and the kids have been reading quite a few books about Myths and Legends (my son was given a stunning new book which he loves and keeps reading – but that is another post) so I thought the Weather Myths might be a good Friday activity for us. I started by printing out the Weather Myth flashcards. I liked these because we could look at the picture and the main sayings together, discuss what we thought it meant (and yes in case you are wondering my kids came up with some very creative explanations) and then turn over the card to see the real explanation. And I must admit these worked better than I initially expected. My son loved hearing the logic behind some of the them and then “talking it out” – he would expand on the explanation and discuss it to come to his own conclusion. He was enjoying discussing all the explanations so much that I suggested he might like to create his own one. He initially agreed and selected the Swallow colouring page to use. But once he started colouring it in he declared that it was just so logical – the swallows flying high because the insects were high that there could not possibly be another explanation. His dad was actually working for home so he charged upstairs and informed him of how we no longer need to check the weather forecast he is now going to use the Myths to forecast the weather for us. My daughter opted to write a story based on one of the Weather Myths. And she really did. She created her own story about a little girl who was out walking when a thunderstorm started. I was really impressed with how the one little saying inspired her to create her own story. We really enjoyed reading about the different weather myths and learning a bit more about British Weather along the way. It ended up being a great Friday activity for us. 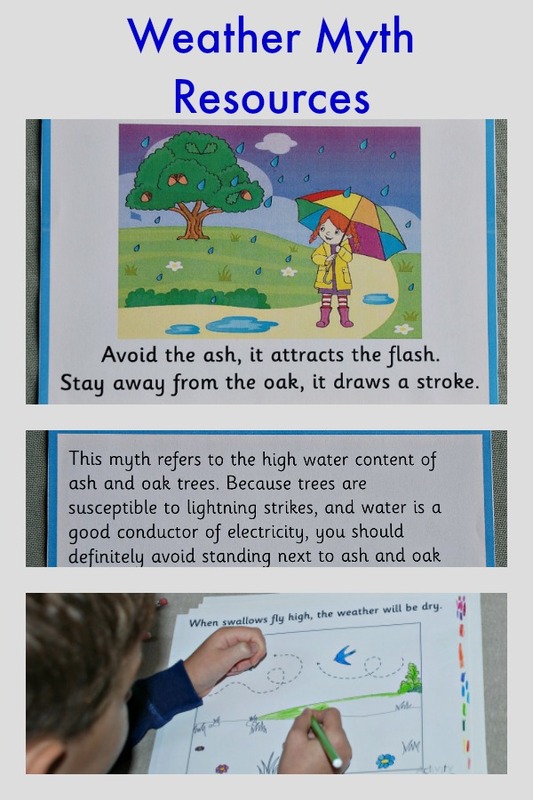 This entry was posted in Homeschooling and tagged activity village, home ed, home education, homeschooling, learning about weather, science, weather myths. Bookmark the permalink.